Laser Genesis is FDA approved for wrinkle reduction, improving skin elasticity, treating scars, normalizing pore size, reducing redness and correcting sun damage. The treatment is popular among men & woman alike and treats those conditions that are typically associated with aging skin. Laser Genesis is a non-ablative procedure that can reduce visible facial vessels as well as diffuse redness, port-wine stains, acne scars, large pores, and fine lines and wrinkles around the mouth and eyes. It works by gently warming the upper dermis, stimulating the growth of new collagen, improving the appearance of your skin. The result is a healthy looking and vibrant appearance. Unlike many other procedures available today, with Laser Genesis skin therapy with the CoolGlide®, Begin with your Skin Medspa Center can safely treat your entire facial area, and neck, if there are undesirable veins or redness present. What are facial vessels or telangiectasia? Telangiectasia or facial vessels are dilated capillaries that commonly appear on the surface of the face and in areas around the nose, cheeks and above the neckline. Capillaries are tiny blood vessels that are present throughout the body. Prolonged sun exposure, aging, trauma and other factors can cause capillaries to become dilated and visible. There is also a hereditary factor in developing facial telangiectasia. Laser Genesis therapy will help your appearance by treating any visible trace of these unsightly veins. Diffuse redness is a general appearance of facial redness, such as rosy cheeks. As with facial telangiectasia, this condition is a result of dilated capillaries, however the appearance is more of general redness rather than discrete well-defined vessels. The most commonly affected areas are the nose, forehead and cheeks. Diffuse redness is often associated with a condition called rosacea and it can be hereditary. Laser Genesis therapy will help your appearance by gently treating and reducing the condition. Dr. Anderson may recommend maintenance treatment with a cream applied to the areas of rosacea for an extended period of time. What about fine lines and wrinkles, acne scars, etc.? Areas of fine lines and wrinkles around the mouth and eyes are related to loss of collagen associated with age, sun exposure, and the sucking action of smoking. 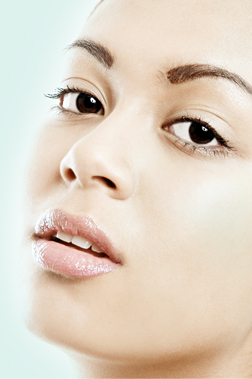 Acne scars and large pores are associated with decreased levels of collagen within the skin. Gently warming the skin with the CoolGlide® genesis treatment stimulates the growth of new collagen to improve the appearance of the damaged skin and create a vibrant, healthy appearance. There are no complicated pretreatment rituals with this procedure. Prior to the actual Laser Genesis treatment you will be asked to remove your make-up or moisturizers and in some cases, you may be asked to shave the area to be treated so as not to interfere with the laser treatment. Dr. Anderson will review and assist with all pretreatment requirements. The treatment results are often very subtle. On average you may require four to six treatments in order to achieve the results you are looking for. Every patient's conditions and needs vary. For more information about your expected results or the number of treatments necessary, schedule a free skin evaluation. No, Laser Genesis is a comfortable, non-ablative, non-invasive treatment. Unlike other laser treatments it does not wound the skin's surface therefore virtually eliminating the need for complicated post treatment care. Typically patients describe the treament as a gentle warming of the surface. The treatment does not require any anesthetics, creams or gel. The laser handpiece does not touch the skin in Laser Genesis treatment. Instead, it is held about an inch above the skin area to be treated. As the pulses are delivered the handpiece is moved over the area causing a gentle rise in temperature until reaching the therapeutic level. Immediately after the treatment you will experience some minor redness and the feeling of warmth. The redness and warmth typically last only a few hours. Patients often describe the treatment as relaxing and therapeutic with visible results that are subtle yet noticeable. You can expect to immediately return to normal activities utilizing sunscreen if participating in outdoor activities. You can re-apply makeup immediately. Although most patients report few if any side effects, the most commonly noticed might be a slight redness that disappears within a few hours after the treatment. Schedule a free skin evaluation with Begin with your Skin Medspa Center for complete information on the benefits and risks of treatment. No! Unlike other systems, the Genesis Plus requires no anesthetic creams or gels before treatment. Gel is messy, time consuming and uncomfortable. The Genesis Plus is the next generation in laser collagen stimulating treatments -- NO GEL! Very! The Genesis Plus has been FDA cleared. It has been rigorously tested in clinical studies. The laser handpiece was designed to treat the diffuse redness, discrete facial veins, wrinkles, scars, etc, while not damaging the surrounding skin or tissues. The cost will vary with the extent of the area to be treated. The exact cost can be determined at the time of your consultation. Because the treatment always takes more than one laser session we have put together several affordable package price structures designed to make your treatment affordable.